In Search of David Long's 751-point "Adventure"
Around the time (in 2012) that I was developing and Kickstarting Colossal Cave: The Board Game, I took the time to port Donald Knuth's advent.w from CWEB to ANSI C99, thus creating a version of Crowther and Woods' Adventure that was playable both in the terminal and on the Z-machine. Then I went on to port David Platt's 550-point Adventure 3, David Long and Doug McDonald's 551-point Adventure 6, and finally Peter Luckett and Jack Pike's 440-point Adventure II. All of these are available (and playable) via my GitHub. Adventure 6 is the most interesting of the bunch. The particular 551-pointer that I ported is due to Doug McDonald circa 1984 (hence its taxonomical name, MCDO0551); but McDonald created it by adding only a few treasures and puzzles to a 501-point version created by David Long circa 1978. "adven - original adventure game in FORTRAN" (mirror) (IFArchive mirror), posted on 1990-05-18 to comp.sources.games by Bill Randle on behalf of Chris Rende, then collected onto a "Giga Games" shareware CD in August 1993. Taxonomized as ANON0501. advent-5.2.2-5.tar.gz (mirror), described on the IF Archive as "FORTRAN source code of 501 points version of Colossal Cave by David Long, version 5.2/2, October 1979, converted to FORTRAN 77 by Johann Gunnar Oskarsson". Taxonomized as OSKA0501. "The AI Attic", for example at ftp://ftp.ntua.gr/pub/lang/AI_ATTIC (mirror), has three different versions of Adventure: WELL0550, MCDO0551, and ARD_0550, respectively. None but MCDO0551 are descended from LONG0501. Magnus Olsson compiled MCDO0551 for MS-DOS in 1991; a DOS executable is available, but no source. (IFArchive mirror) (mirror) This Japanese blog contains some screenshots associated with OLSS0551, but they're actually screenshots of Mike Arnautov's ARNA0770 (or maybe ARNA0660), not OLSS0551 after all. That's enough about McDonald's Adventure 6. Elsewhere in the world, circa 1978, David Long was announcing that his own expanded "Adventure 6" would be released in summer 1979! Long's "Adventure 6" was eventually released, and even appeared on CompuServe — but the actual source code and data files have been lost. Apparently Long's expanded Adventure was a 751-pointer (adding 250 points on top of the previous version's 501). Therefore, in the nomenclature of the Adventure Family Tree, we call it LONG0751. I would love to get a copy of David Long's expanded Adventure. If you know anything about it; if you've played it; if you remember a computer system where it existed; or if you can help me get in touch with David Long himself; please email me! 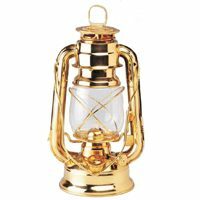 In June 1990, there was a long thread (mirror) on alt.folklore.computers, originally about Zork, but eventually turning to Adventure. (Notice that ANON0501 had been posted to comp.sources.games in May 1990.) On 1990-06-12, one J.C. "Lum" Johnson of Ohio State posted a transcript of a version dated ADVENTURE <6.04/ 6>, 2-Nov-84, and containing the complete "History of Adventure (Abridged)" by W.I. Zerd (mirror). Lum Johnson's transcript includes thanks (from Long) to one Eric Weber and congratulations to one Robert Silverman. Back in the Usenet thread, Evan A.C. Hunt (of SCO) expressed interest in getting a copy, but that's where the thread petered out. I have so far failed to make contact with Lum Johnson or Evan A.C. Hunt. In the same thread, Tim McGuire, John G. Hardie, Cliff Tuel, recall playing a different (non-Long) Adventure expansion featuring a witch's gingerbread house. I have never seen this variant, and would love to hear more about it. In March 2014, I contacted Carl Ruby in re this message (mirror) on the Delphi "Colossal Cave" forum. Carl told me that years earlier (between 1982 and 1993) he played LONG0751 on CompuServe, and that — amazingly — he had actually implemented a sort of "black-box recreation" of the whole game in QBASIC, and that he still had the QBASIC source code! This means that a large swath of LONG0751's geometry, room descriptions, and messages have survived — basically anything that Carl saw during his time playing the game. Notably, the QBASIC version does not contain any references to the endgame "repository", and its scoring code seems to be a simplified version of a 350-pointer's, instead of going all the way up to 751. Carl Ruby's QBASIC source code, including a bunch of distinctive messages, is mirrored here. The ancient coat-of-arms of the family of Aldor consists of a gold fiddle-dee-dee with bronze oak leaf cluster. Stemming from the cluster are three brass spheres, under which is the family motto (obviously in Latin): "IN HOC TU OFFEN". The pumps have run too long without cooling off! From deep within the mine the engine's throbbing becomes a loud vibrating roar as the great engine tears itself apart. All around you timbers are cracking! The entire roof of the mine is collapsing! You are in the Conservatory, whence the gnomes often repair to relax with a little music. On one side of the room is an old upright piano. You are beside an old dry well in the East Courtyard of a great castle built against the southern face of an unscalable granite cliff. On your left an impregnable wall of gleaming white stone encompasses the entire court and castle in a half-moon shaped curve which meets the cliff at either end. To your right, across the steeply rising courtyard, is Lords' Keep, the heart of the castle. There was a brief thread on rec.games.int-fiction on 2000-01-20 through 2000-01-25. On 2000-01-25, Robin Lionheart posted a version of the "History of Adventure" (mirror) that largely matches Ruby's QBASIC version. From 2008-10-09, another reference to "Adventure 751" on CompuServe, in a blog comment thread on the subject of "Stupid Puzzles" (mirror, contains partial spoilers). Independently, I've found confirmation that a 751-point Adventure was present on CompuServe in 1983. According to gsbrown, the brochure "CompuServe Games Highlights" was included in the December 1983 issue of Today, CompuServe's magazine for CIS subscribers. Here is the page dealing with "New Adventure", billed as "the enhanced version of the original Adventure game". This is the enhanced version of the original Adventure game. It was expanded from the original to provide more challenges and more dangers for the skilled player. Its comprehension of English has been improved to understand such phrases as, "Take this and that." SCORE Shows your current score. INVEN Shows what you are carrying. BRIEF Suppresses printing of long descriptions for places that have already been visited. DIAGNOSE Reports on your injuries, if any. EXAMINE Tells you about objects. SAVE Saves the state of the game for continuation later. RESUME Restores a SAVEd game. TREASURES Manipulates nearby treasures as a group. The existence of the "DIAGNOSE" verb is a dead giveaway that the CompuServe game is a descendant of LONG0501. LONG0501 and its descendants are the only branch of the Adventure family tree that include "DIAGNOSE", which Long borrowed from MIT's Dungeon (later Zork). In fact, the wording "Reports on your injuries, if any" is taken straight from the dungeon(6) man page (mirror). "Enhanced Adventure" was still available on CompuServe as late as June 1995: see this article (mirror) from the Chicago Tribune. However, beware that the "Enhanced Adventure" moniker was also used for Dave Platt's 550-point Adventure (see), so references to "Enhanced Adventure" elsewhere don't necessarily refer to LONG0751. In March 1998, David W. Payne posted to rec.games.int-fiction (mirror) asking for information on LONG0751. Payne reported that he had been in contact with David Long "years ago", and that Long had been trying to rewrite the game from Fortran into C++(!). I have not managed to contact David Payne yet. 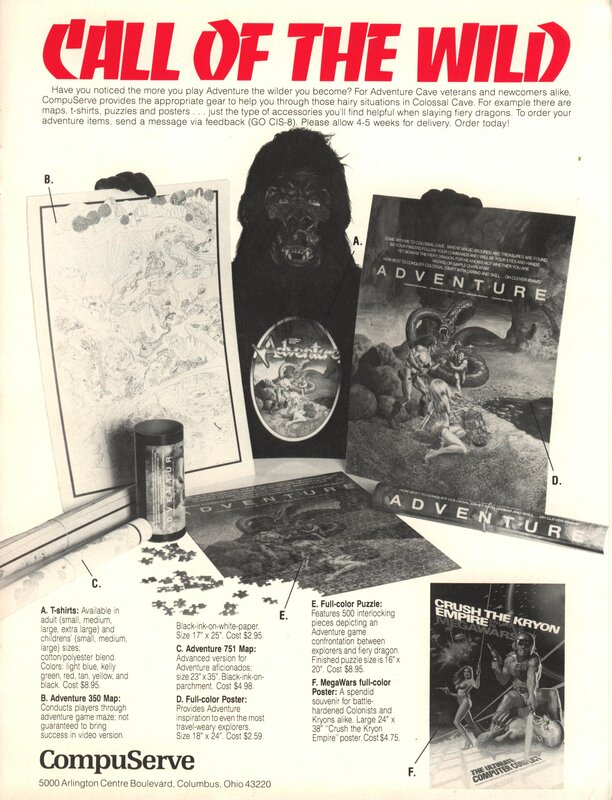 Circa 1982–1984, CompuServe's catalog contained an advertisement offering maps of "Adventure", both the 350-point version (17x25 inches; $2.95) and the 751-point version (23x35 inches; $4.98). 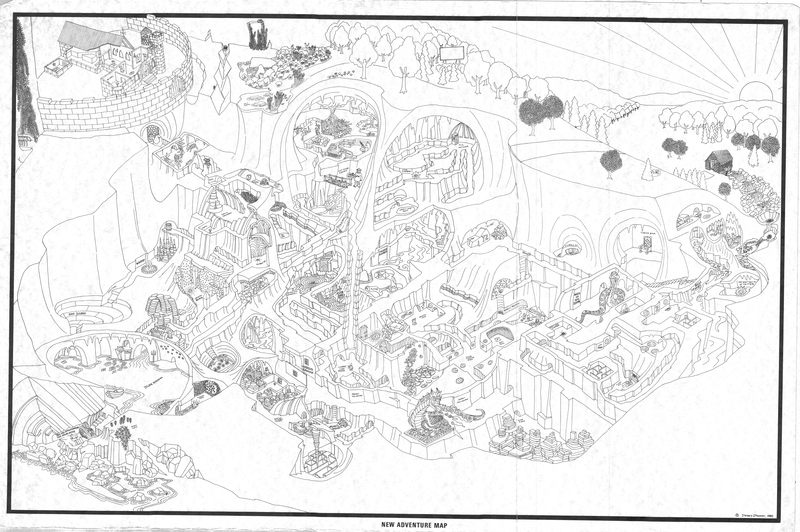 Jason Scott reports that the 350-point poster was drawn by Dennis Donovan in 1981. I can personally confirm that the 751-point poster contains the signature "(c) Dennis Donovan, 1980". This ad was recalled by Jason Scott in a 2008 blog post (mirror). A low-res image (mirror) was shown in an August 2007 blog post by "Banewood" (real name unknown to me), the poster having been presented to him by his acquaintance (professor?) Don Huffman. On 2017-01-29 I was contacted by someone selling a "New Adventure Map" on eBay! 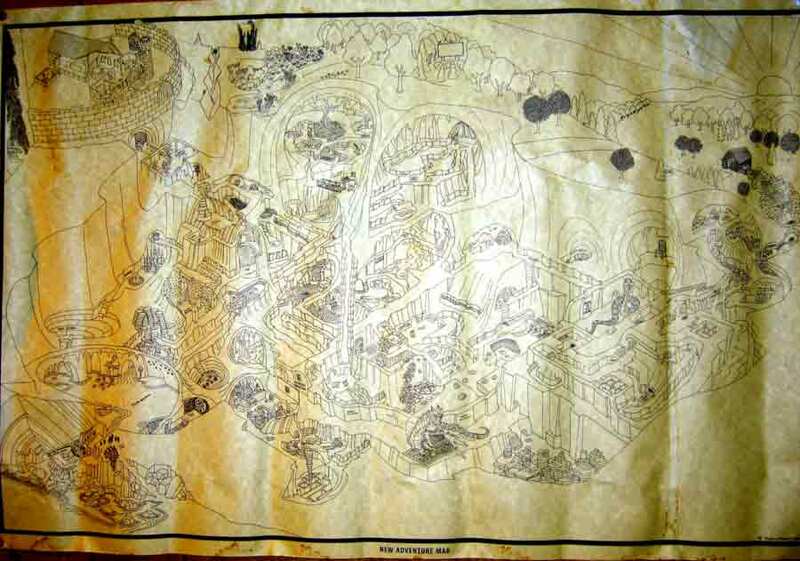 I jumped at the chance, and am now the proud owner of an original Dennis Donovan "New Adventure Map". Here's a high-quality PDF of the map (7MB) and a high-quality JPG (28MB). Dalenberg calls this version ANON0501. This version has a spider, a fly, and a magic word "Shamut". Since these appear in neither MCDO0551 nor RUBY0751, I believe they didn't appear in the original LONG0501 either; and I wouldn't expect them to appear in LONG0751. My theory is that they were added by an anonymous implementor sometime between 1978 and 1990. This version is composed of 91 separate .f files, including a "monitr.f" implemented by Mike St Johns and dated 1978-01-02. The in-game "History of Adventure" help text is dated November 1978, so either Mike St Johns was working with David Long, or (more likely) St Johns implemented wizard mode for a 350-pointer in January, which Long then built on top of over the next ten months to create LONG0501. I don't know whether LONG0501 was composed of many .f files, but it seems reasonable to suppose that it was already composed of many .f files in January 1978 when St Johns added his (single-.f-file) contribution. MCDO0551 replaces the many individual .f files with a single file "asubs.f" containing all the necessary subroutines in alphabetical order. Some subroutines, such as YESM, XSPEAK, and notably MONITR, have been removed in McDonald's version. Dalenberg calls this version OSKA0501. This version also has the spider and "Shamut", which implies that it's descended from ANON0501, not from LONG0501 directly. According to comments in the code, Oskarsson (a.k.a. "Myrkraverk") did his Fortran 77 port in the year 2001, and the version in the IF Archive is dated "Patchlevel 5, Mars-2003". Like ANON0501, OSKA0501 is composed of 91 separate .f files. Russel Dalenberg has posted a whole list of Adventure variants he's heard of but never seen, including one from Colorado State University featuring a witch's house. Walt Stoneburner is looking for a text adventure named "The PITS" that was on The Source. I'm looking for Bob Maples' text adventure Castle Quest, which was on both CompuServe and GEnie. There's some information here (mirror). Someone else is looking on /r/tipofmyjoystick, and again /r/tipofmytongue. On 2016-08-19, I was contacted by one of the original authors, Michael Holtzman! He doesn't have a copy, but he was able to set me straight that Bob Maples was merely the publisher; Michael Holtzman and Mark Kershenblatt were the original authors. They wrote it while at RPI "in the late '70s", and was ported to The Source, CompuServe, and GEnie by Bob Maples some time after that. Another contemporary reference to this particular Castle Quest: The July 1983 issue of Compute! 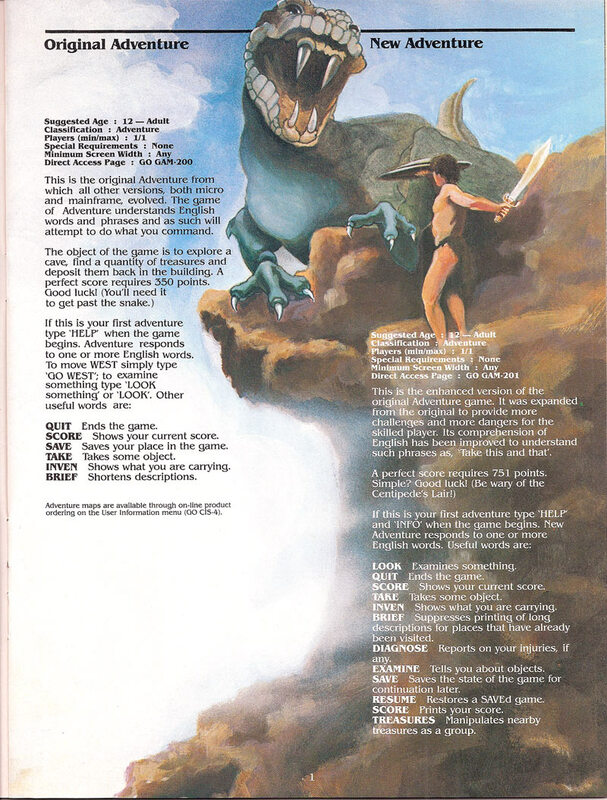 magazine, pages 85–90, contained a listing for a BASIC game named "Castle Quest" by Timothy G. Baldwin. It bears no resemblance to the text adventure. In the October 1983 issue, page 10, appears a (mis)correction: In our July 1983 issue, we inadvertently used the name "Castle Quest." The publication of this article is in no way intended to cause confusion with the commercially available product called "Castle Quest" by Michael S. Holtzman and Timothy Baldwin. In the future, we will refer to it as "Castle Search." Then, in the January 1984 issue, a correction to the correction: Our reference to a game by Michael S. Holtzman and Timothy Baldwin in the October 1983 issue was incorrect. It should have been: Michael S. Holtzman and Mark Kershenblatt. I'm also looking for Bob Maples' game Black Dragon, which was on both The Source and GEnie, as well as CompuServe from at latest May 1989 to at least June 1995. Daniel Lawrence describes it as a "DND clone". There's some information here (mirror), and a walkthrough by Barbara Baser here (mirror). As with Castle Quest, it seems likely that Bob Maples was merely a publisher and porter, not the original author. Sadly, it appears that Robert Henry Maples, Sr., himself, died in April 2001 (see). All original code, images and documentation on this page are freely distributable. Please keep them that way.